Kathrine Switzer began training for the 121st Boston Marathon about 18 months ago. Editor’s note: Kathrine Switzer finished the 121st Boston Marathon in 4 hours, 44 minutes, 31 seconds. “Um, can you hold on? Somebody is at my door. Hold on,” she says a few minutes into a telephone interview from her home in New Paltz, N.Y.
She comes back to the phone about 40 seconds later, her voice conveying a mixture of disbelief and wonder. “Somebody has just sent me an armload of roses. Now, how’s that?” she says before explaining the floral bundle is from an old friend — “the sweetest supporter in the world” — who is an ultrarunner from Syracuse, where Switzer herself attended college. 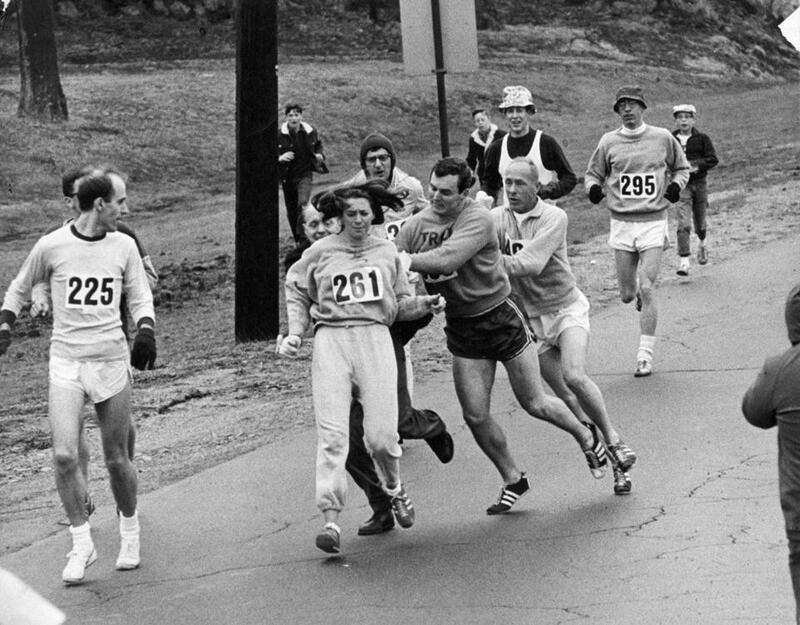 Where is Kathrine Switzer’s 261 bib from the 1967 Boston Marathon? Switzer will again wear the number in Monday’s running of the Boston Marathon. At 70 years old, Switzer’s time is in high demand. In addition to her scheduled appearances in the days leading up to the 121st Boston Marathon, she will hold the tape runners break at the Boston Athletic Association Invitational Mile on Saturday, throw out the first pitch at the Red Sox game on Sunday, and signal the start of the women’s elite race on Monday. She has also organized 125 charity participants for the marathon through her 261 Fearless foundation, which she founded in 2015 with four partners to help empower women across the globe through running. Oh, and she actually has to run the marathon. Not only will this be her first time running Boston since 1976, this will mark the 50th anniversary of then-race director Jock Semple trying to rip off her 261 bib number and throw her out of the race. She went on to complete the 1967 Boston Marathon in 4 hours and 20 minutes, becoming the first woman to finish Boston with a bib number. 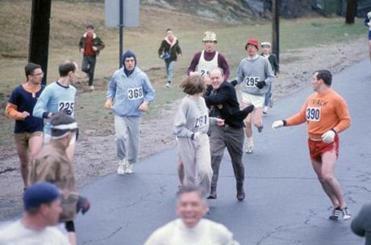 Kathrine Switzer’s then-boyfriend Tom Miller shoved Jock Semple when Semple tried to rip off Swizter’s bib number. But Switzer welcomes these demands on her time — she calls them celebrations — while still understanding the physical undertaking she’s pursuing. She just wants to get to the starting line in Hopkinton healthy. Switzer could feel herself getting envious. She was 62 years old and hadn’t run a marathon in more than 30 years. But she was meeting women her age and older who were training for and competing in marathons — successfully. She asked her husband, Roger Robinson, if he thought she could get it back. Switzer won the 1974 New York City Marathon and finished second in the 1975 Boston Marathon. She went on to launch the Women’s International Running Circuit, a series of women’s races and marathons across the globe that led to the inclusion of the women’s marathon for the first time at the 1984 Olympic Games. “It’s just, I want to see what it feels like, and I wonder if I can get it back,” she responded. No stranger to disregarding limitations put on her by others, Switzer set out to find her marathon stride despite her age being perceived as a weakness. “ ‘You should be careful, you’re old, you’re frail. You’re going to have a heart attack. If you push too hard, you might have a stroke. You’re going to damage your knees.’ All of these things. So at 63 years old, she completed the 2010 Athens Marathon. A year later, she completed the Berlin Marathon. “I trained my brains out and I did get it back,” she says. About a year and a half ago, Switzer met with her physiotherapist to discuss training for the 121st Boston Marathon. Her physiotherapist made two points clear: Cut your workouts to every other day and prioritize recovering. Switzer said she doesn’t have a finishing time in mind for Boston, but that she simply wants to finish. “And I screamed because I’m an everyday kind of runner,” she says. In her training, she has completed two 20-milers, crossed the three- and four-hour run mark a few times, and has mixed in speed work, running 800 or 1,000 meters at a 5K pace. She has also focused on core workouts two days a week. During her peak as a competitive runner, she would run 100-plus miles per week and do at least one 26.2-mile run before each marathon. Not this time. “But I’ve never been 70 before,” she says. The biggest challenge of her training was changing running shoes in March. Adidas came on as a late sponsor for her and her 261 Fearless charity runners, and she had to adjust. Fast. She recently clocked 9-minute miles in the Cherry Blossom 10-Mile Run in Washington, DC. Now, her biggest concern going into Boston is getting enough rest prior to the race. Before beginning the Boston Marathon in 1967, Switzer ate a hearty breakfast with her team: bacon, eggs, pancakes, juice, coffee, milk, and extra toast. And she put on lipstick — despite her coach’s objection — just before getting to the start line. On Monday, she’ll eat two breakfasts — one at the hotel and one again near the starting line — of the lighter variety: A nut butter sandwich, a banana, and a cup of tea or coffee. And she’ll put on her lipstick all the same, this time to no objections. She recalls that race day in 1967 with clarity. She readily explains the emotions she cycled through while convincing herself that she needed to finish the race. She understood what it would mean for women’s running and, to a larger degree, women’s rights for her to complete the race in the face of an aggressive attempt to kick her out. Although she has attempted to pare down her schedule and commitments — 261 Fearless being the newest atop that list — Switzer said Boston is not the last marathon she intends to lace up for in the near future.